Odd things can happen when you're not really book shopping, but you happen to be in a bookstore. Daughter had some gift certificates that were burning a hole in her pocket. Off we went to the bookstore. Now remember, I have about 200 books waiting to be read, so I had no intention of buy another book. That is till we happened onto the rack with clearance books at $1.00. That destroyed my resolve. 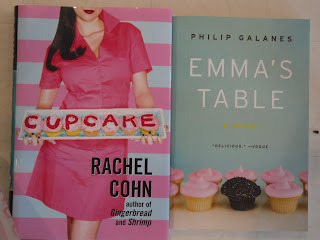 Daughter seclected Cupcake by Rachel Cohn and then I saw Emma's Table by Philip Galanes. I picked it up solely on the basis that it had cupcakes on the cover. Time will tell whether it was a good choice. Don't you love my new socks. They are from a company called Sock it To Me. As much enjoyment as I get from cooking, baking, and trying new recipes, there is the other side. I need to watch that intake and ensure that I am active enough. My sister has challenged me to a race and I know that I need to lose quite a bit of weight before race day. Hopefully this stylish little book from Andrews McMeel will be of help. 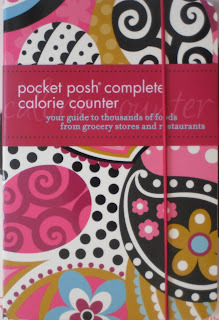 Its the pocket posh complete calorie counter. I have bought similar books in the past, but their covers are so obvious, that they have never left my kitchen. This one is clearly meant to travel with you. 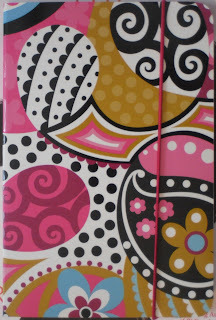 When you remove the title band, you are left with a cool looking book with an elastic closure. I'm looking forward to the publication of their Pocket Posh Cocktail book due out in September 2011. 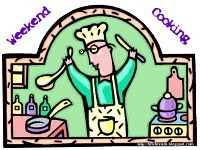 Join in for the fun at Weekend Cooking hosted by Beth Fish Reads. You will find links to a wide variety of food related posts including: book reviews, cookbook reviews, recipes and other food type adventures. Add a link to your current food post. And who could resist a $1.00 book rack? Not me, lol! the cocktail one sounds like more fun than the calorie one...but still a clever idea. and I SO know about having hundreds of books to read and still another one calls to you. can't wait to hear how you like your new book. OOOOOHHHHHH I love your socks. They are the absolute cutest. Just perfect for a foodie. 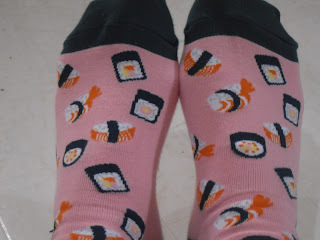 I love how cupcakes, sushi socks, and a calorie counter all end up in the same post! And the photos look completely color-coordinated! I hope the cupcake books are good! What an absolutely cool calorie counter booklet. I agree, most look so obvious and boring that you don't want to touch them. 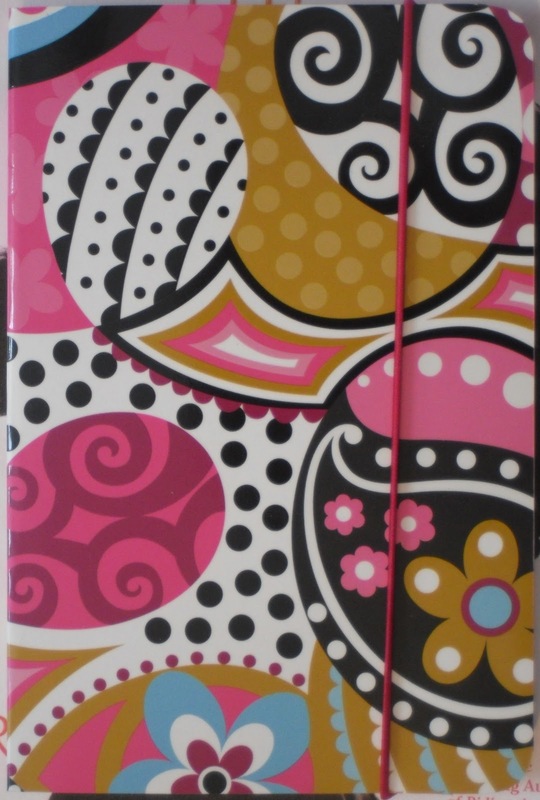 This one looks girly and nice, I love it. What a smart calorie counter! I'd picked the cupcake book, too :) And then definitely would need a calorie counter with cupcakes on the mind! Love, love, love those socks! Will you be baking from the cupcake cookbook soon? I love the pocket counter. I can't resist the sale bins ever! Love your socks...my mom would kill for those. lol. I don't think that either of the books contain recipes, though I do have a cupcake cookbook that I have been meaning to get at. I'll try for a post in April.